Finding a driver that feels comfortable and provides confidence on the tee can be a challenge for most golfers. It’s always a good idea to test drivers from multiple club manufacturers to see what works best for your swing and what brings you a feeling of trust. Since the needs of each swing are different, there are many factors that go into identifying the unique connection between the golfer and the golf club. Often times, it’s simply finding a clubhead that allows you to repeatedly hit the center of the clubface – with the right lie, loft and shaft of course. It’s a scientifically proven fact that the difference between most professional and amateur golfers is the pros typically hit the center of the clubface more often than amateurs. It’s also proven science that a ball coming from the sweet spot will travel much further than a shot hit toward the heel or toe of the club. To help amateurs narrow the gap between their professional counterparts, PowerBilt recently introduced the latest model of their popular Air Force One driver, the Air Force One DFX Tour. Air Force One clubs have the largest sweet spot in golf; one that’s edge-to-edge, as pressurizing the clubhead with nitrogen helps create equal pressure across the entire clubface. This allows golfers of all skill levels to trust their swing since and let this advanced technology take care of the rest. “We are excited to introduce PowerBilt’s first true tour head. Through player input, along with the MyGolfSpy player testing, we were able to analyze all the data and input and develop a top performing Tour head. With the cg moved forward, and the benefit of the Nitrogen Charged technology, the Air Force One Tour will deliver the most accuracy of any tour head on the market,” says Ross Kvinge, President of PowerBilt. The company has incorporated some significant upgrades from last year’s model, but the same traditional clubhead shape, matte black finish, PVD sole and clubface finish is nearly the same. The new version, the Air Force One DFX Tour, features a 9-gram Nitrogen Valve sole port that’s moved 20 cm forward towards the clubface. This moves the club’s center of gravity to a low, face-forward position that helps promote fast ball speed and low spin for more distance. PowerBilt’s patented Nitrogen Charged Technology method to reinforce the clubface without adding weight is still this club’s unique calling card. By pressurizing the clubhead with nitrogen, the Air Force One DFX Tour has the thinnest face in golf. That in turn boosts trampoline effect, smash factor, ball speed, consistency and accuracy — all while reducing spin and producing incredible distance. The Air Force One DFX Tour driver is currently available for right-handers only, so lefties will have to wait. 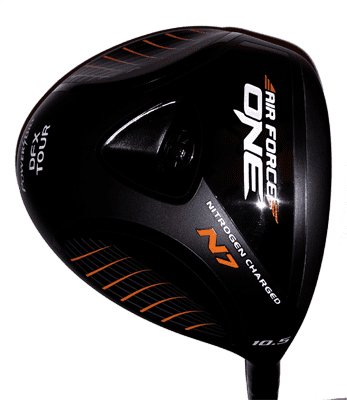 But if you’re right handed and currently combing the isles of your local golf pro shop in search of the perfect driver for your game, give the Air Force One DFX Tour by PowerBilt a swing. A club like this with a huge sweet spot and exceptional distance could be a match made in heaven. You can learn more at the PowerBilt website.